Oh man, I can’t get enough of this ride! Mountain biking from Mount Rose Meadows off Highway 431 to Chimney Beach is definitely my current obsession, and the trails are prime right now. 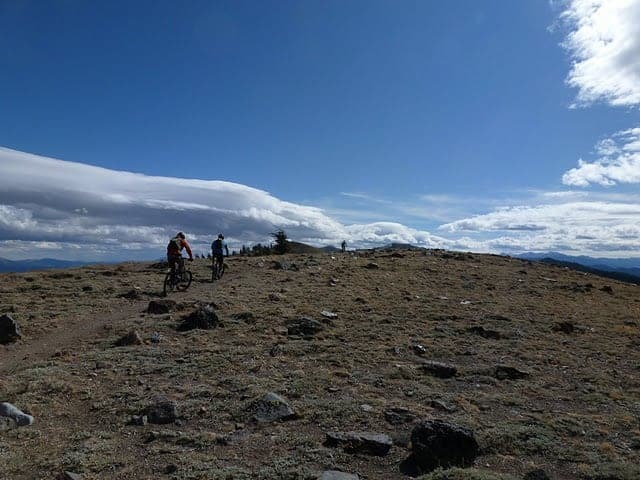 With sun in the sky but moisture in the soil from the past few weeks’ snow and rain, it doesn’t get much better for mountain biking in Tahoe. The Chimney Beach downhill can get pretty sandy and loose, so it’s a treat to catch it in this condition. You’ll need to prep for this ride with some shuttle drops. We managed to make it happen with 10 people (yeah, we were a big crew!) and one car at the bottom of the Chimney Beach downhill (two folks hitchhiked back up, and two cars had to return back to pick up the other riders). The best map of the ride I found was from MountainBikeBill.com. 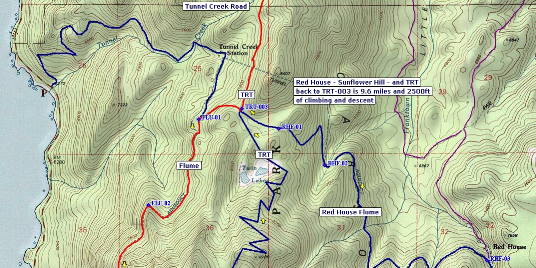 Here’s the full Mount Rose Meadows to Chimney Beach map, with other options also highlighted. As you can see there are loads of ways to do this. I’ve taken the Flume (which is a must-do) but recommend the Tahoe Rim Trail to Marlette Peak route (which we took on this trip) for an extra cardio kick and to bypass the Flume crowds on weekends. I’ve zoomed in on a few key sections below so you can really get a view of the important turns. 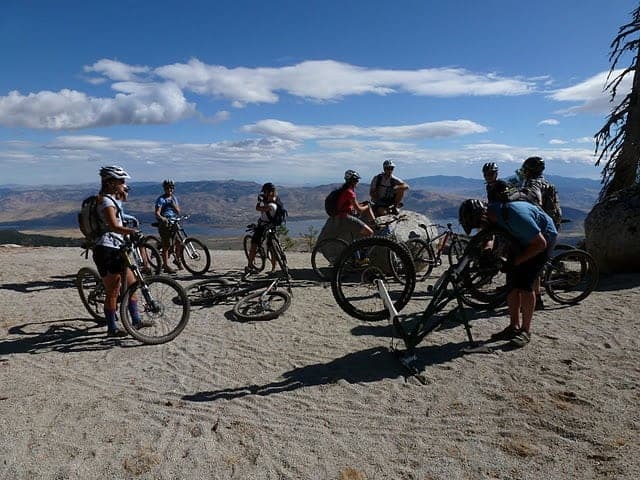 Climb, climb and climb, gradual with a few technical spots, up to views of the Carson Valley. This is where we took one of our first rests to wait for the group to all catch up. 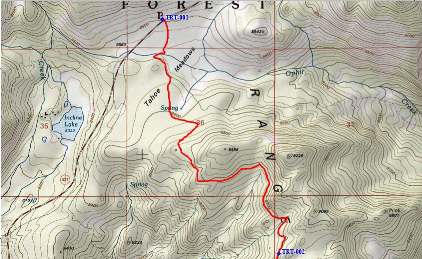 Then continue on until you get to a main intersection with lots of ways to go: down Tunnel Creek to the Bonanza set, around to the Flume Trail (red line), or up the Rim Trail to Marlette Peak (blue switchbacked line). It was Sunday and the trail was fairly busy so we kept climbing. 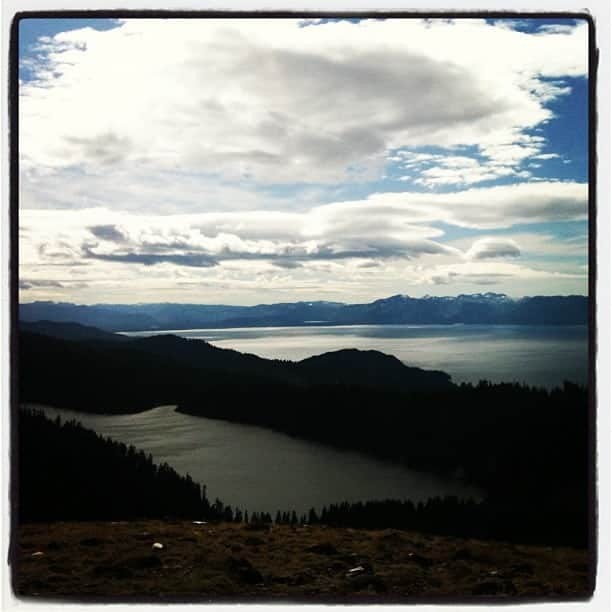 The climb is worth it though since the views from Marlette Peak are epic! Evidence: the first photo in this post. You’ve gotta take the dead-end vista trail (like we are below) to get the full view. So awesome! 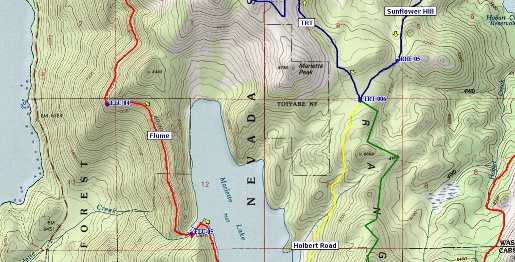 From here, you cruise back down to Marlette Lake on a fire road (yellow line) and catch up with the Flume folks. Awesome aspens here, another bonus for going in the fall. Head uphill (south) from the lake on a fire road climb. 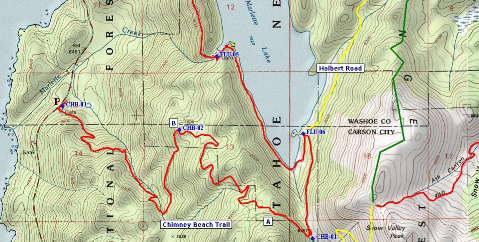 At the crest of the fire road, to hop on the Chimney Beach downhill, look for the small singletrack heading northwest. One last uphill push and then it’s all downhill from there! 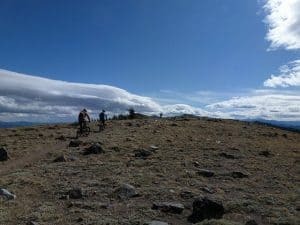 The Tahoe Mountain Sports Adventure of the Week blog series takes a walk (or hike, surf, climb or Tahoe mountain bike) in someone else’s shoes, from pro athletes to local Tahoe adventurers. Let us know if you’ve got an adventure to share. Previous PostSalomon Vitane Boot Review, from a flat foot Next PostLadies Night is Back!